These WEB pages are dedicated to the PRESERVATION of Telegraph History, Lore, and Instrumentation. You will find an On-Line Cyber-Museum with (copyrighted) downloadable illustrations showing Collections of Telegraph Instruments, Microphones, and Radios, a Telegraph History and Bibliography, Telegraph Lore, Museums of Scientific Instruments, Antique Psychological Instrumentation, and links to other sites of interest. As a telegraph operator and collector for over 45 years, I have amassed a collection of thousands of telegraph instruments which I display in these museums. I have always been fascinated by the undersea world and, as you can see from the other links in this section, much of my diving has been involved in locating and recovering the early Atlantic submarine telegraph cables which linked, for the very first time, the United States and other countries in the world. 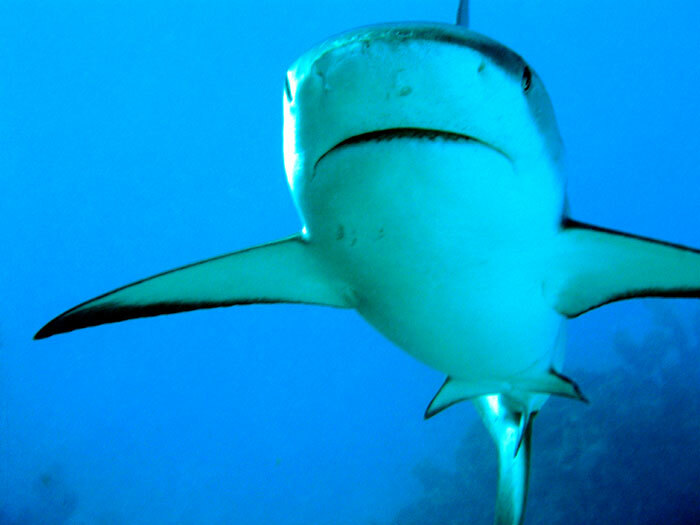 I have also been fascinated by the behavior of the sharks that I encountered during my dives. 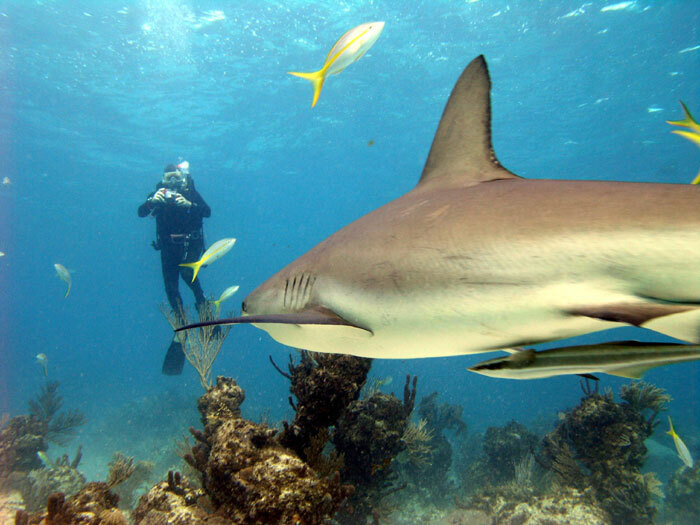 On a trip to the Island of Abaco in the Bahamas, I decided to ask local divemaster Tim Higgs of Abaco Dive Adventures: (http://www.abacodivers.com) to take me on a trip to observe the behavior of as many sharks as possible. I had dived with Tim the previous year when he took me into an extraordinary Bahamian Blue Hole to see the elaborate underwater stalactites and the blind eyeless cave fish. I consider Tim to be the best divemaster with whom I have ever dived in over 600 dives and I knew the trip would be memorable since he specializes in catering dive adventures to the needs and capabilities of his many clients. The brief trip to the reef brought us to an area with excellent visibility and many fish. Tim brought along a good supply of raw fish to feed to the small fish and they were soon swarming around the boat. 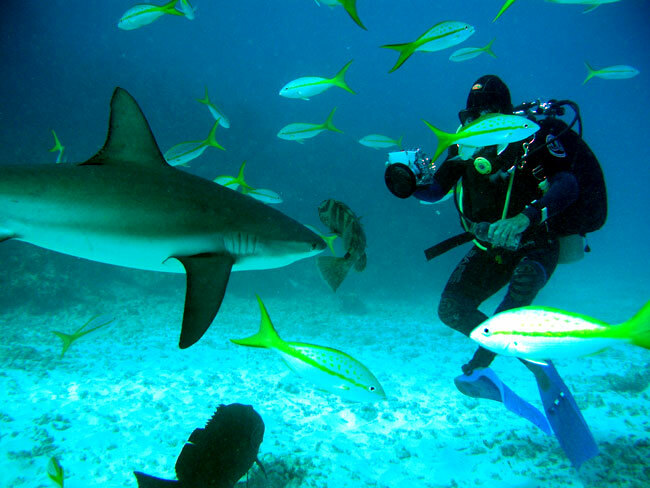 Tim does not believe in feeding the shark directly but has found from experience that the well-fed smaller fish attract the sharks very effectively. 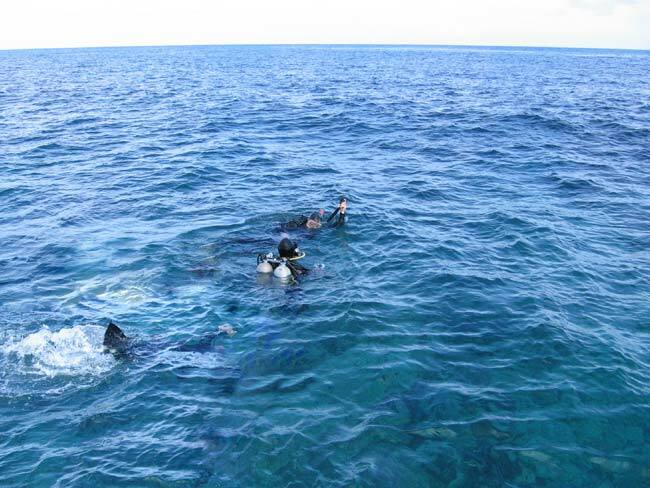 Soon a large fin appeared among them and it was clear as we dropped to the 60- foot bottom that the sharks were here. Tim took this photo of me as I adjusted my camera unaware of the shark peering over my shoulder. Tim continued to take photos of me as I took photos of the sharks and watched very carefully for any signs that they were preparing to attack us. It was apparent that the sharks were very curious about us and that they were considering whether we would taste good but they generally remained at a distance of a few feet as they circled us continually and watchfully. I was able to reach out and touch several of them without producing any noticeable reaction as they continued their inspection. 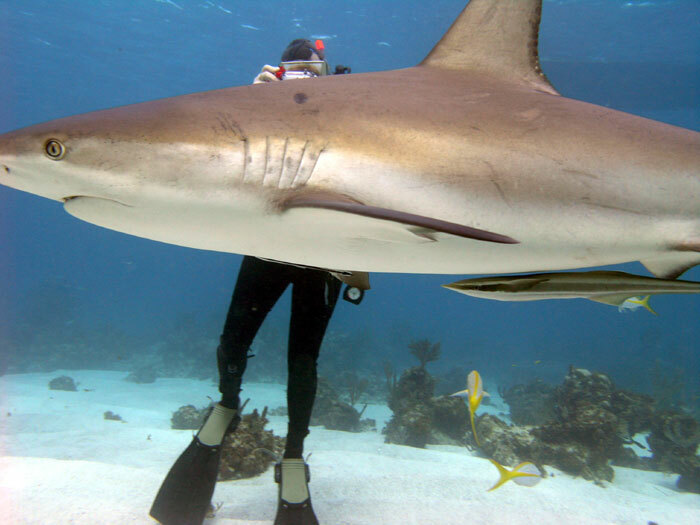 Tim warned me, however, that stirring up sand with my fins would attract a great deal of attention from the sharks since much of their natural prey also stirs up sand. 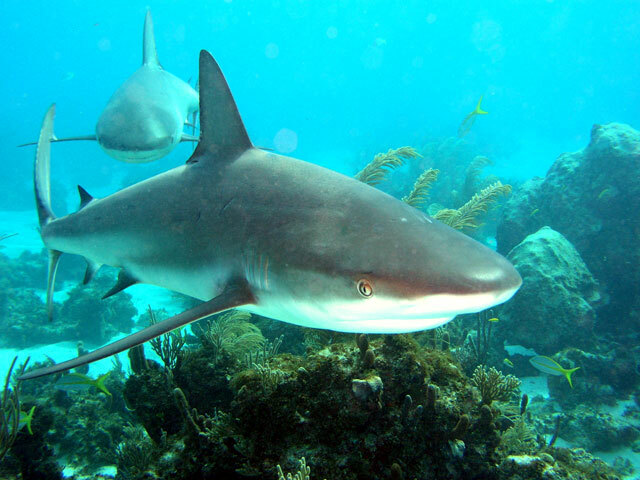 My photographs did not come out as well as Tim's but they do show some pretty large sharks. 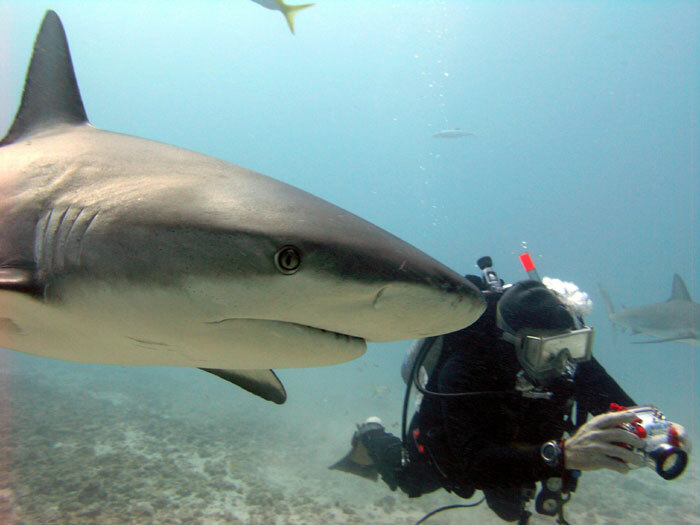 At one point during our two hour-long dives, a shark began to become more than a little curious about Tim who responded by assuming a rather aggressive posture. 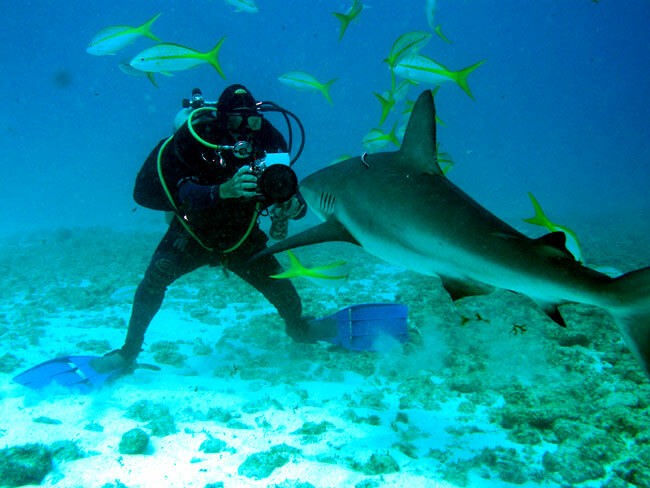 Tim finally had to hit the shark rather sharply on it's nose with the lens of his camera which he brandished when necessary. People often ask about the danger posed by sharks. 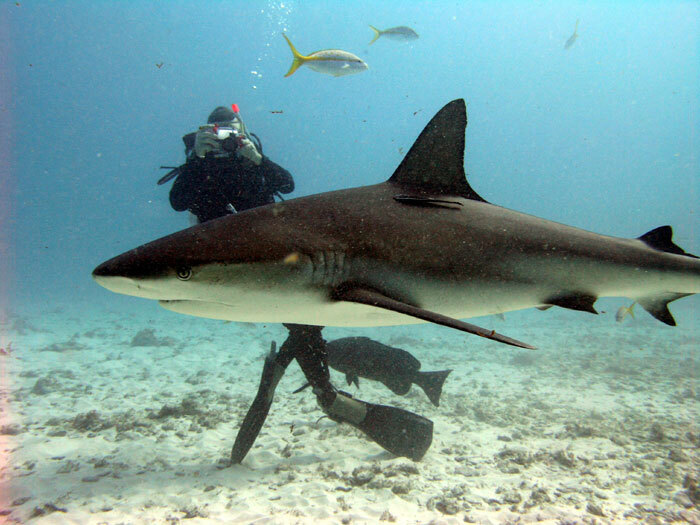 As shark protection during my early diving in the 1950s, I carried the military surplus World War II shark repellent packages of dye. Their effectiveness was questionable and when the Farallon "Shark Dart" came on the market, I bought two of them and have carried one on every dive since then. 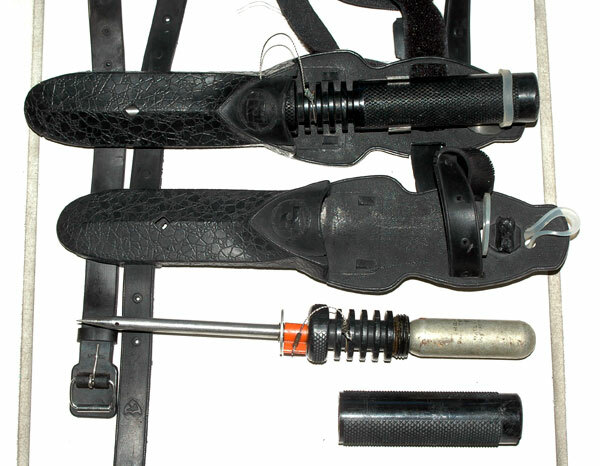 The Farallon "Shark Dart" consists of a sharpened hollow spike with a high pressure Carbon Dioxide cylinder at one end. 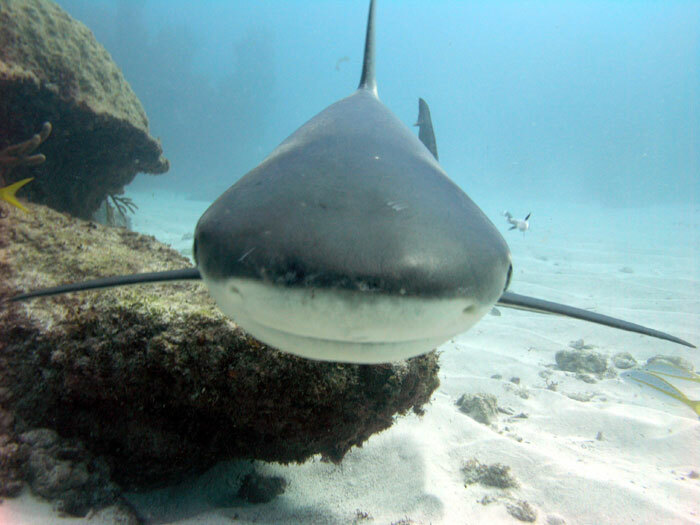 When you poke the spike into a shark, a sharp pin is supposed to puncture the cylinder and the gas travels out the hollow spike and into the shark. The gas inflates the shark like a balloon and it is forced to the surface where it can do no harm. I only had to actually draw the dart on one occasion during which I lunged at an attacking Bull Shark with it and the shark instantly turned away and was gone. 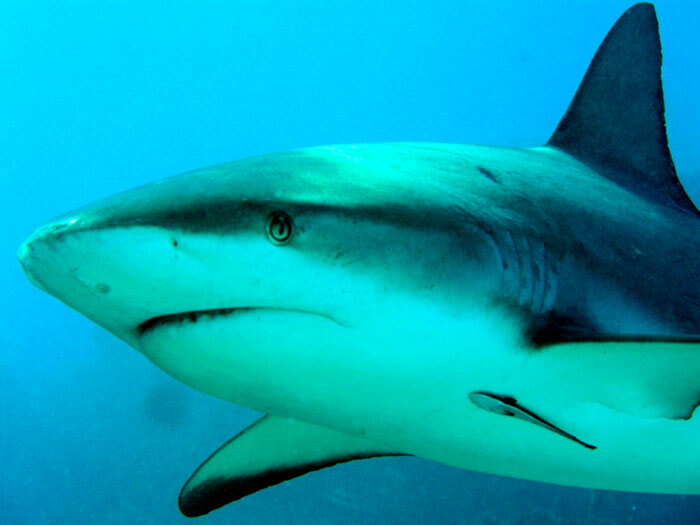 Shark are not used to having their "prey" attack them. As a result, I have never seen whether the dart can actually protect a diver as it is supposed to do.